Note this speech by our President was delivered in the year 2000. See his comments below under World Abalone Market. The year 2000 was a “sellers market”; however large production increases in the following 8 years have caused downward price pressures in 2007/2008 which will continue in 2009. See our Presidents comments under World Abalone Market (below) in 2000. His 2000 suggestions as to what actions should be taken are even more powerful for 2009 and beyond. ABSTRACT The world supply of wild fisheries catch and cultured abalone production are considered with implications of the past, present and future. Much of the data available in recent years from various government sources and even FAO have often been inadvertently misleading. Reporting has often combined a number of dissimilar abalone products (fresh in shell, frozen meat, canned, dried etc) with misleading results. Surprising numbers result from this effort to standardize the production and export information for both the commercial catch and cultured product. Discussion of factors affecting abalone FOB and CNF prices. Review of market form (live, fresh, frozen, canned, dried) and how pricing is affected by processing and packaging as well as economic conditions. A review of suggestions for value added abalone product and the challenges of sustaining world demand at premium prices. Abalone Fisheries: The total allowable annual commercial landing quota (country by country) expressed in terms of "in shell" weight. This category would include the planting of seeds in large areas of the sea wherein the sea bottom has not been prepared with man placed rocks or structures. This definition does not include the legal sport catch or any illegal catch worldwide. Intensive Culture: The farming of abalone on land or sea - -contained in man made tanks, nets or structures. Extensive Culture: Sea planting of abalone seeds in artificially arranged substrate or structures, with or without adding food. The Illegal Catch: Any taking of abalone beyond the total allowable annual landing quota. To discuss the topic of World Supply without consideration to the illegal catch would be grossly misleading. 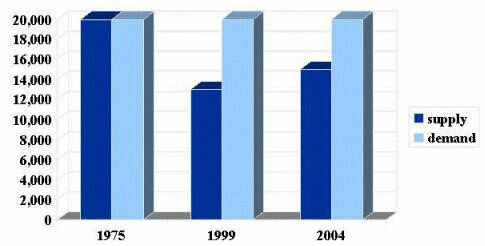 Abalone Fisheries declined an additional 30% over the past 10 years. * Oman, So. Pacific, Misc. ---Cultured Abalone production increased over 600%! * Iceland, Ireland, Europe, Pacific Rim. 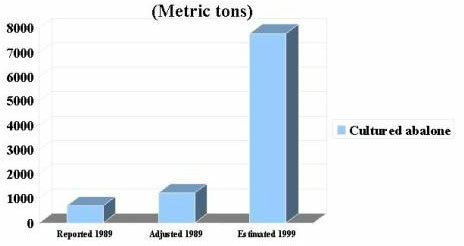 Of the total estimated 1999 cultured abalone world production of 7,165mt, Asia accounted for 5,500mt or 75% of that total. Within Asia, the vast majority of the cultured abalone production is from China and Taiwan. FOB AND CNF PRICE FOR SIMILAR SPECIES AND SIZE TENDS TO EQUATE WORLDWIDE. 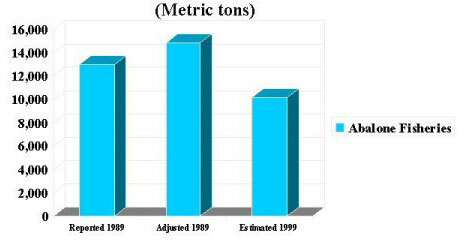 Expressed in terms of "in shell" weight, the world price for the same size and quality "in shell" abalone tends to come together regardless of the form to market. Example one: cultured Red abalone in the 90mm-size range. (The principle is the same with other species as adjusted for the size/weight ratio of that species). Many of the Asian traditional recipes call for dried abalone as their preparations began thousands of years before refrigeration. There are a few special (often secret) processing methods creating a dried product which sells for a minimum of $700 per kilo and as much as $2,000 per kilo or more. This dried abalone is not to be confused with the "standard" sun dried product that sells at lower price level. The preparation of this specialty-dried abalone is almost ceremonial, often prepared with unique coals and slow cooking in ceramic cooking utensils. Only about 10% of the "in shell" weight remains in the dried product. The preparation process is highly laboring intensive and takes months to complete. If the processor pays $32/kilo "in shell", and sells the premium product for $700/kilo, he is making only a reasonable profit for the effort. Example two: A live 90mm abalone at the Japanese wholesale (auction) markets. There are fisheries pricing services that regularly publish an average of 10 major Japanese wholesale markets. For the sake of comparison, we will use a price of 4700 yen/kilo. This equates to approximately US$45/kilo. Does that mean you might sell these markets at a C&F level approaching these prices? Not by a long shot: there are auction commissions, wholesaler commissions, trading company commissions, local transportation, customs and duty - -all to be deducted from your selling price along with possible mortality deductions. In effect $45/kilo equates closer to $32/kilo. $20/Tin of just 252g of abalone = only $12/kilo "in shell"
If the "in shell" weight is 1425g (H. rufescens, 8pcs, 100mm "in shell" for example) shucking will yield about 640g of meat which after cleaning and trimming will yield approximately 390g. After cooking the meat, you will find only 252 grams. In effect, after shrinkage and canning cost, a $20 tin of 252g meat equates to an "in shell" price of only $12/kilo. Without the continued development of premium product and brand name tins, canned abalone will remain as a commodity with relatively lower prices. Prices are currently driven by a handful of Asian Nations, guided by their historical and changing customs, preparations, populations and economies. An important additional influence is that of Asian populations living elsewhere in the world. As displayed earlier, Regardless of the form to market (live, fresh, frozen, boiled, canned, dried etc) the abalone price "in shell" tends to equate worldwide. Of course there will be shorter-term price variances as the economies of that handful of Asian buyer countries weakens or strengthens. In recent years, we have seen a substantial weakening of the Japanese economy - -now recovering. On an equivalent yen basis, adjusted to US$, $37/kilo for a given size and quality in January 1998 would equate to $41/kilo in January of 1999 and $45/kilo in January 2000. During this same period, PR China's economy has markedly strengthened. Just a few years ago, the majority of the abalone farming production in China was designed to export this premium product to Japan and elsewhere. Today, virtually all 3,000+ tons of China's abalone production is consumed internally. Break Away from World Pricing. If you are responsible for larger quantities of abalone, whether fisheries or cultured, you have some important choices to consider. Continue the selling pattern. You may continue along the lines of the patterns mentioned earlier (prices likened to a commodity - -driven by Asian Markets - - varying by species and size) which tend to equate on an "in shell" basis worldwide. OR, you may begin to break away from the "price equation" through implementing any one or several of the following choices. Continue to develop a premium export market for export and within currently exporting countries. The exporting nations must not take for granted that premium prices will continue forever. Considerable effort will be required. You may hear "we had a strong abalone market within our Country in the late 60's early 70's HOWEVER that was when prices were very low". Let's re-examine, on an inflation adjusted basis: a $30/kg price today would equate to a $6.79/kilo price in 1970 - -That "expensive" restaurant abalone meal at $45 today equates to a $10 "expensive" abalone meal in 1970. The premium pricing in the "home market" of the currently exporting nation will not remain as a "given". Abalone will never become a low cost food, however effort and promotion will be needed to maintain the highest market pricing levels. Brand name product. Much of the fisheries and aquaculture world has worked with brand names for many years. It is rare in the "abalone world". Premium (higher than the most common denominator) pricing is achievable through developing a high quality product and telling the world all about it. Sous Vide and "skin packed" fresh and frozen. We have a "food service" "ready to eat" "fast food" industrialized world, yet abalone traditionally goes to market in the same basic forms (live, fresh meat, frozen, canned etc.) and is distributed to the same standard markets. 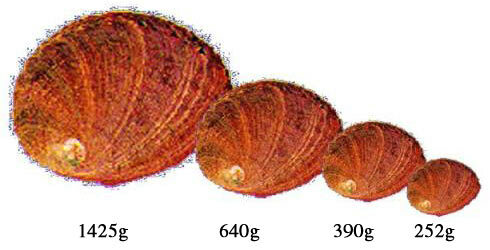 Larger producers should consider developing "heat and serve" processed, prepared abalone dishes. This may sound like heresy to the abalone traditionalist, however it is a clear path toward maintaining premium prices in the home markets of the abalone exporting nations. Some companies have been promoting vacuum pack/skin pack for many years and with rewarding results, however they represent only a small fraction of the marketplace. Fast food need not be a low priced food. A Hong Kong food chain is currently promoting an abalone fast food concept with a single unit generating over US$2,000,000 annually. Multi functional processing and packaging. Industrialized nations need to develop low cost production possibilities with highly mechanized food service facilities. (This level of processing is quite expensive, but could be accomplished on a co-op basis). Today several industrialized nations have such plants under operation for bivalves. A modern, low cost process complex might encompass six multifunctional production areas: raw material supply, raw material pre-treatment, processing/transformation, preservation, packing, storage. Direct approaches to DWE's (Distributor, Wholesaler, and major End Users). The methodology requires considerable effort, yet is rewarding. It is your market study that selects the DWE, not the reverse. 1975 Supply 20,000mt (on an adjusted basis might have been 24,000 mt or more). There was no major shortage of product forcing a demand/supply balance. 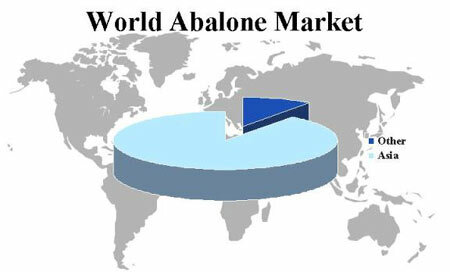 World Abalone Supply: Over the past 10 years, the Abalone Fisheries of the world have declined 30% while the worlds Cultured Abalone Production has increased over 600%. The trend toward larger cultured premium species will continue. Ten years ago a 70mm animal was considered "market size" whereas today it is closer to 90mm. Some production at 120mm or larger will be required in the future. Looking ahead to the year 2004. We anticipate the abalone fisheries to remain fairly flat at the 10,000 to 11,000mt levels, while cultured abalone farms are anticipating very substantial increases. Political, environmental and pathological events will, of course, have some unknown impact on world abalone supply. We have been discussing a strong world demand and "shortfalls". We are NOT discussing an automatic demand at a premium price. Outside of the Asian world, the desire for this "caviar in a shell" priced animal will be directly related to our industries quality effort in the marketplace. Among other things, this should include Sous Vide preparations, brand identification, sophisticated processing facilities and unique DWE programs. For the sake of our own and future generations, we must do a better job of protecting the world's abalone fisheries, however it is the cultured abalone industry that must not only expand production, it must put forth efforts to assure a continual world premium market. Murphy, D.E. 1999, S.Africa Abalone Poachers. Times/Mirror Co.
Sunee,S.C. 1999 US National Marine Fisheries.